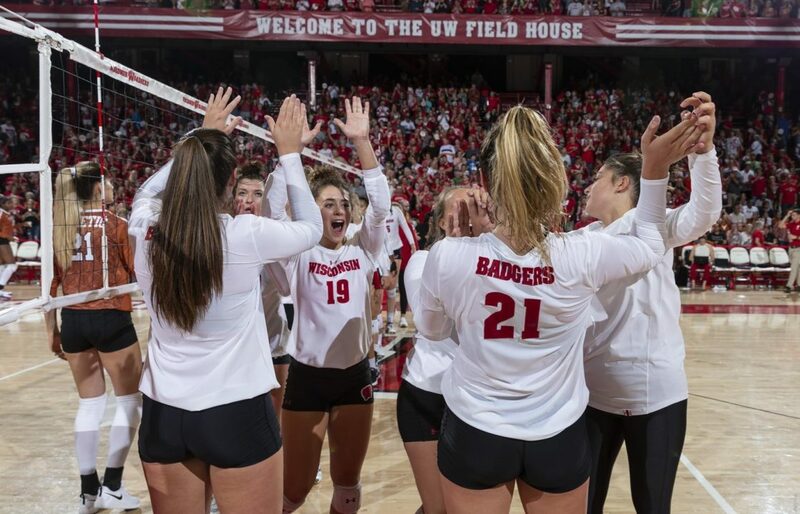 MADISON, Wis. – The sixth-seeded Wisconsin volleyball team earned a first-round victory over Green Bay Thursday night at the UW Field House on the first day of the 2018 NCAA Tournament. The Badgers swept the Phoenix, 25-9, 27-25, 25-15. After a quick Wisconsin (23-6) first set victory, Green Bay (20-11) responded with a 5-0 run to start the second set. UW responded to erase the deficit, but the Phoenix rallied again late in the game to serve for two match points. With the set on the line, the Badgers stayed hungry and earned two match points of their own before sealing a 27-25 victory. Wisconsin led from the first point to the final point in the third set en route to a first-round win. The Badgers hit .293 (45 kills – 9 errors – 123 attempts) on the night while holding Green Bay to a .030 (30-26-134) hitting percentage. Sophomore Molly Haggerty led UW with 10 kills and was balanced by sophomore Dana Rettke with nine kills, sophomore Grace Loberg with eight kills, and senior Tionna Williams and junior Madison Duello with seven kills apiece. Defensively, Wisconsin out blocked the Phoenix 11-5.5 behind five blocks each from Rettke and Williams. The Badgers also earned a 62-60 advantage in the backcourt. Junior Tiffany Clark and Haggerty both tallied a team-high 15 digs. Sophomore Sydney Hilley recorded her team-best 14th double-double of the season with 36 assists and 12 digs. The 6-foot setter has six double-doubles in the last seven matches. Sophomore Molly Haggerty had 10 kills and 15 digs for her eighth double-double of the season and 17th of her career. UW has won its last seven matches, its longest winning streak of the season. Green Bay’s hitting percentage of .030 is the second lowest by an opponent this season. “First of all, congratulations to Green Bay on an excellent season. Like Molly (Haggerty) was saying on the way down, it was hard to score against those guys. Defensively, they played so hard. That libero is as good a libero as we’ve seen this year. I thought she was fantastic, and we knew that going in. She passed at a real high level. Our game plan as we were going on is whatever side she’s on, serve the opposite side. Let’s not even let her get her hands on the ball. Defensively, I thought she was really special. “I told the team after the match, I’ve learned in my experience that you shouldn’t talk much with your team after a loss. This is a different loss. We’re disappointed of course, but what we’ve accomplished this season, I’m so proud of and I’m so proud of who our student-athletes are as people. They’ve really come together and been amazing teammates so that’s something else I’m really proud of. I’m proud of who these ladies stand for and I told the seniors that they’re leaving a legacy. That was their goal at the beginning of the season and they’re definitely leaving a legacy with this program. The Badgers face Pepperdine Friday in the second round of the NCAA Tournament in the UW Field House. First serve is set for 7 p.m. and tickets may be purchased at the gate. MADISON, Wis. — The Green Bay volleyball team concluded a successful season this evening in the First Round of the NCAA Tournament against the #6 Wisconsin Badgers, falling in three sets despite a thrillingly tight second game. The Phoenix finish the season at 20-11, following their first-ever Horizon League regular season championship and first berth to the NCAA Tournament since 2003. Green Bay was neck-and-neck with Wisconsin in the first set (9-25), tying the game at four points apiece before the Badgers took 21 of the next 26 points. Instead of being discouraged, the Phoenix answered by opening the second set with a 5-0 run, forcing a Wisconsin timeout. The team continued to fight throughout the game, even out-blocking the towering Badgers four to three. Green Bay claimed set point twice before their opponents managed to pull off the win, 27-25. Wisconsin pulled off a sizable lead early in the final set (15-25), with Green Bay never being able to come within five points of their in-state foes. The Badgers weren’t able to completely snuff out the Phoenix, however, as the teams traded nearly every point starting when Green Bay was behind 3-9 and ending when the Phoenix were down 11-16. A 4-0 run by Wisconsin sealed the outcome. Freshman Alexandra Zakutney had quite the evening, tying her career-high kills for three sets with 13 and leading the team by far in the process. Senior Jessica Wolf added six kills of her own, as well as three blocks at the net. Also attributing to the team’s blocking total was sophomore Ashley Sledge, collecting four throughout the night by helping with nearly every stop. The defense was all over the court, with three players making it into the double-digits for digs. Senior Austyn Everingham was a force during the first two set, scooping up 10 of her 11 total, while classmate Vanessa Buman held down the fort in the last set by picking up 11 of her 20. Sophomore Taylor Wolf was consistent in the back line during the entire match, also amassing 11 digs. The program waves farewell to three standout seniors: Vanessa Buman, Austyn Everingham, and Jessica Wolf. As a class, the group won 75 matches, earning several league awards in the process. Those include Buman’s Defensive Player of the Year award, Everingham’s All-Academic Team honors, and Wolf’s All-Tournament Team recognition, all occuring during this season. Buman collected an impressive 1,481 digs in her career, moving her into 5thfor all-time digs. Her average of 4.13 career digs per set also places her 4thin those standings, helped by her strong seasons as an upperclassman. Everingham will cement her place in the record books by playing in 452 sets throughout her entire career, the fourth-most for a player in program history. She will also end as the number 7 player for all-time digs, finishing her career with 1,366 total. J. Wolf executed 1,071 kills as a Phoenix, taking over the fourth-place spot for most kills in a career and eighth-place spot for most points during her time, despite missing several matches in the beginning of this season, showing her significance to the team.